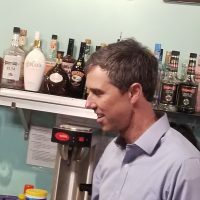 Hundreds of people packed the Beancounter Coffeehouse on Thursday afternoon to hear presidential hopeful Beta O’Rourke speak on the first day of his campaign. “This right now, right here, in Burlington… is democracy in action,” O’Rourke told a crowd of supporters. He spoke for roughly a half-hour on topics including universal healthcare, justice reform, climate change, and immigration before taking questions from the audience. The former Texas congressman announced his intention to run for the Democratic nomination early Thursday morning. He joins a crowded race against Bernie Sanders, Elizabeth Warren, Julian Castro and around a dozen others. Former Vice-President Joe Biden is also expected to announce his intention to run.